Smartphone’s have been around for a few years now. Almost everyone nowadays owns a Smartphone so it’s not surprising to see that people are starting to love it for the wide range of apps that it provides. Another aspect of smart phones that is definitely on the rise is mobile gaming. In fact android is a best platform for smart phone users with lots of built in apps and all apps are separate with specific categories where gaming is one of the most popular categories on Android marketplace. There are tons of free as well as paid apps for android available on marketplace. 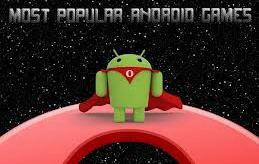 Below are few most popular android games on android marketplace these days. May you heard regarding this game recently it’s the world most popular mobile game and gamers love to play this game on smart phones and want to whole the competition of this game. It’s designed by Imangi Studios with nice graphics and easiness to understand. It’s a juicy action game with squishy, better graphics and very easy to understand. If you love endless runner gaming genre on your Android mobile or device then you should try out Fruit Ninja for a real fun. Tupsu is one of the most beautiful android games which were launched in 2013. There are three special worlds contains 30 levels, in each world you will be guide this small creature to a portal while collect all the specified stars in each level. You manage this creature using its extremely sticky eyes. It’s the second game in ExZeus series with quality 3D graphics. ExZeus 2 is for the lover of shooting based action games. There are lots of schemes in the game as well as external USB controllers too. You can also upgrade its weapons as well as skills. So if you enjoy action and arcade type games then must try ExZeus 2. If you are game lover, then all games are must a try for you. About Author: An article is written by Hammad Baig, He is a blogger, marketer and an android lover and loves to write about android, Gadgets, smart phones etc.